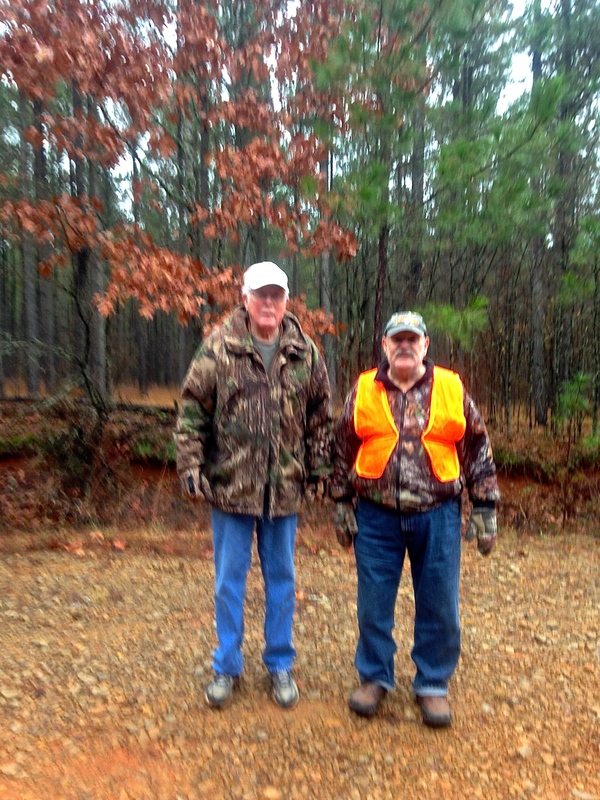 “I’ve never gone 7 days of hunting this property and not seen a single deer,” said Ray, my father-in-law. To be fair we’d seen a lot of deer moving on and off the property. 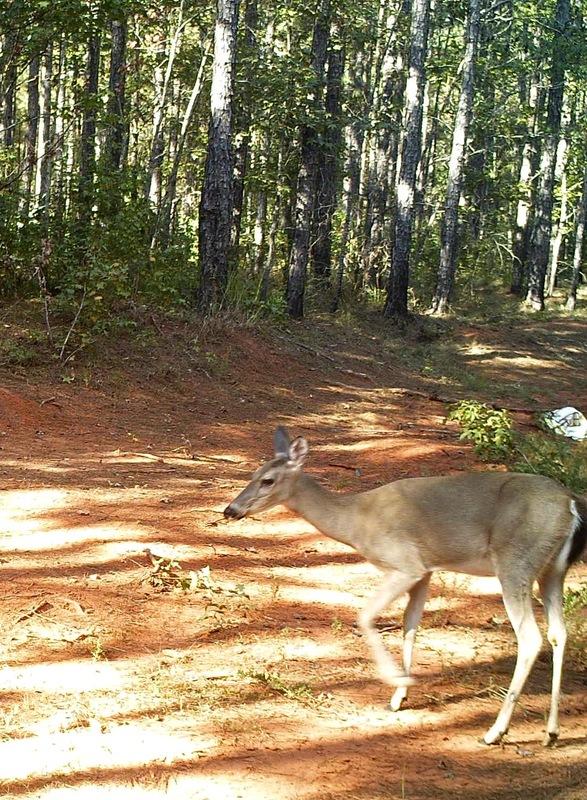 The trail cameras show lots of deer. Neither of us has spotted a deer while bow hunting. 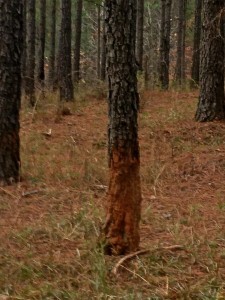 Early in the week there was sign that the deer where moving near the spots where blinds or tree stands are positioned. 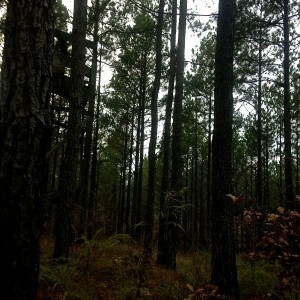 The past two days as I approached what we had considered good hunting real estate I had my doubts. On each day was we approached the property for hunting we observed plenty of early afternoon deer. Since neither Ray nor I had seen anything while hunting we decided to stay as late as the legal limit allows. We’d considered that perhaps we’d been leaving a bit too early. This, even though we’d seen deer moving between 3:30 PM and 4:30 PM. Deer are most active in the early morning and around twilight. They bed down during the day. But, they do get up, stretch and move around during their less active times. Ray prefers, he’s nearly 90 years old, to get out into the woods around 4 PM. He says that the early morning hunts aren’t as appealing as they were a few years ago. So we hunt for those twilight deer. Last year, Ray got 7 deer and I took 2 while hunting in the afternoon. So, on the third day of bow hunting season 2016, we remained in our concealed hunting spots as long as legally possible. Even though we stayed later, we still did not see any deer. On day four, out of curiosity, I got up early and headed out just to take a look. Not a single deer. I checked areas where tracks are often in abundance; there were only a few. What we have noticed is a lot of deer moving as we head onto the hunting property. They’re out there, they’ve just moved away for the moment. We’ll need to go scout around to see where they’ve gone. 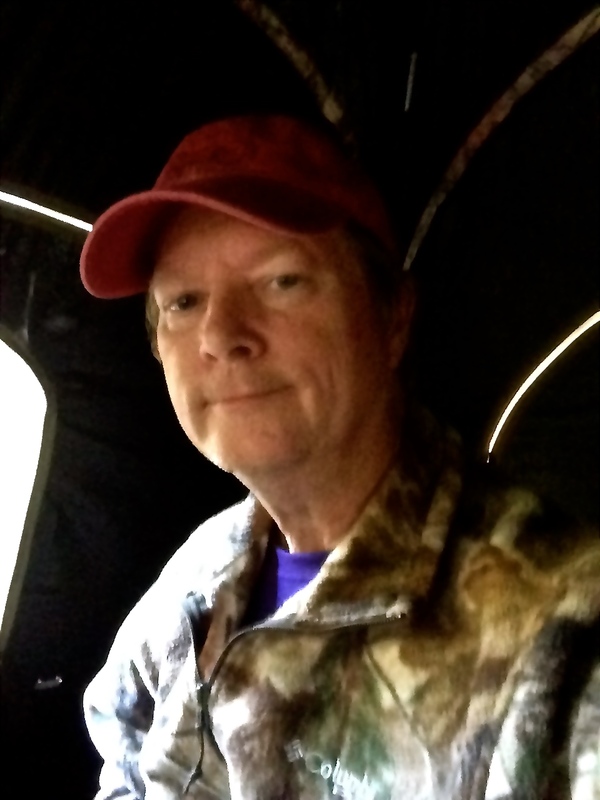 Author David LainPosted on September 24, 2016 September 24, 2016 Categories Archery, HuntingTags Outdoor Adventure, SportsLeave a comment on Where are the deer? It is bow season! We’ve seen there are a lot of deer in these woods! 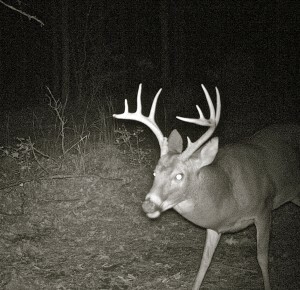 Every trail camera shows deer wandering about day and night. Heck, simply driving into and out of the woods to collect SIM cards the deer practically slow the ATVs due to their heavy foot traffic. Deer are so plentiful it seems to require the need of only an arrow with which to reach out and stab the creatures. The well-placed trail cameras photographed an abundance of doe and bucks with wide thick racks ranging from six to eight points. Deer are everywhere! Any day in the woods is a good day. A few days before Ray, my father-in-law, and I took our bows and headed out to well scouted areas John, a friend and paramedic (always good to have one of those on a hunt), had taken a large doe with his crossbow. John shot the doe within an hour of entering his pop-up blind. This was going to be pick and choose hunting. 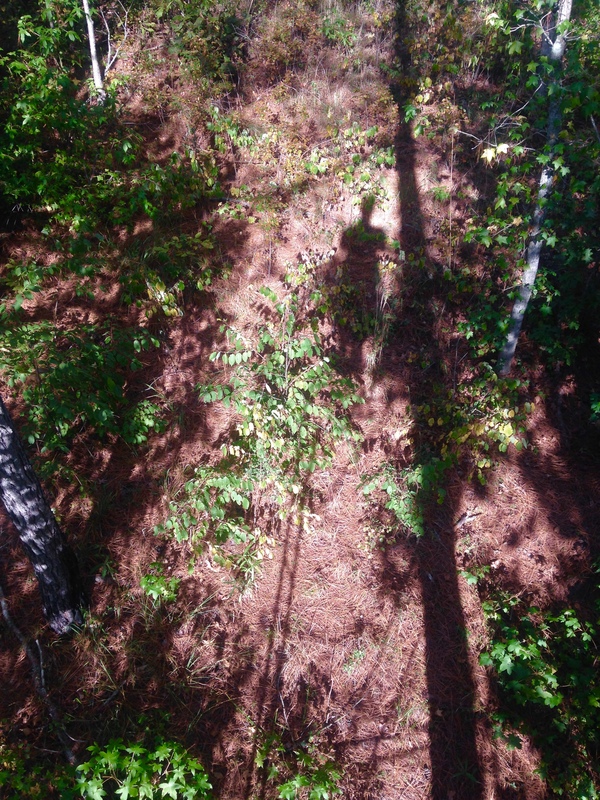 As I approached my tree stand I marveled over all the sign of deer. 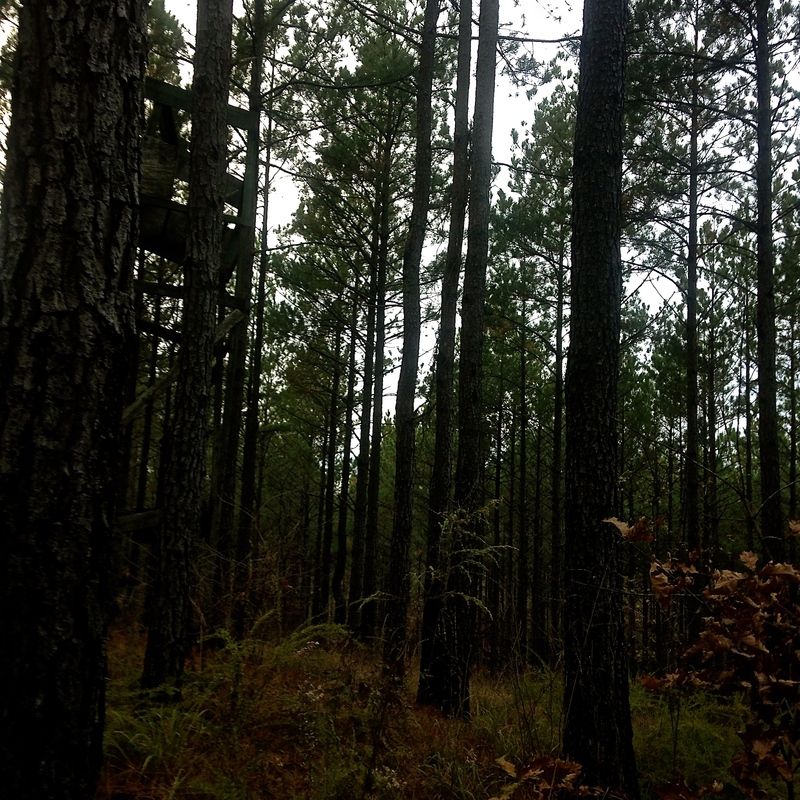 My stand was positioned against a pine tree facing a main wildlife thoroughfare. About a quarter of a mile from my tree stand while walking in several deer stood 30 yards away watching me. Oh man, this was going to be a great day on the woods. Once on my stand I made certain I was secure. 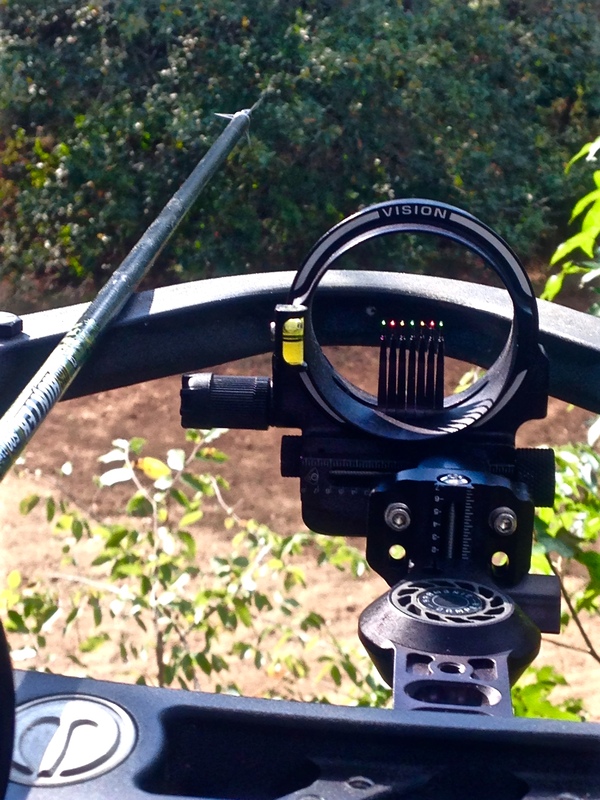 Then, I arranged my equipment, my Elite 35 Energy with a Toxic broad head tipped arrow readied, my range finder tied to the stand, binoculars out and at hand. From my backpack that was lashed to the tree I took my water bottle had had a drink. 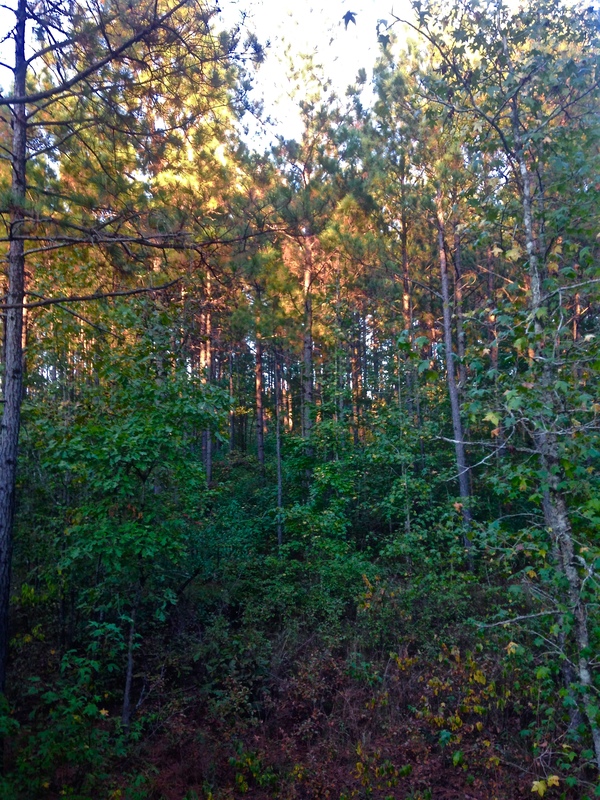 Next, I began scanning the woods for deer. While watching I used the range finder to mark distances where a shot might present itself. 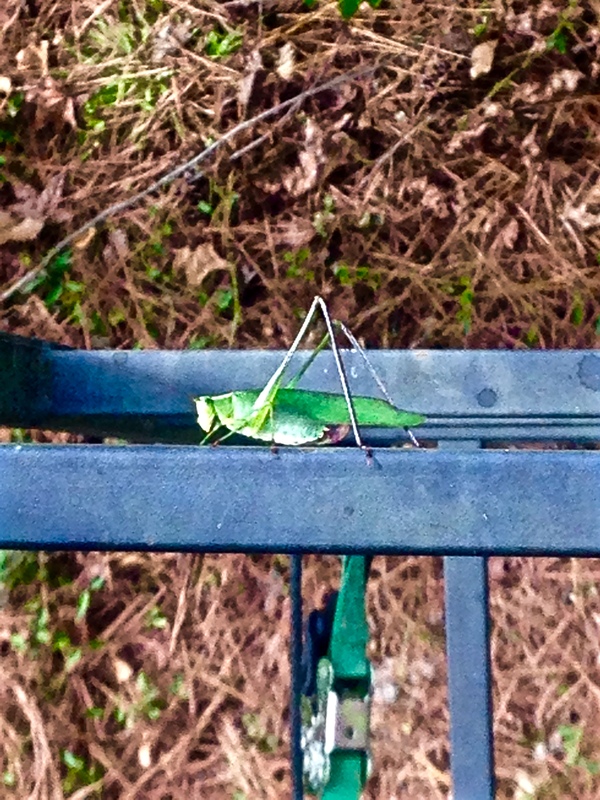 Within minutes, off to my left – noise. Big noise, lots of racket. Cautiously turning I began a detailed survey of the terrain. Nope, no deer only a pair of squirrels that appeared happily gamboling around on terra firma. These squirrels hung around near me for a solid thirty minutes. I eased back and began scanning, eyeballing, and listening for anything that might alert me to all the deer waiting in the shadows and brush. 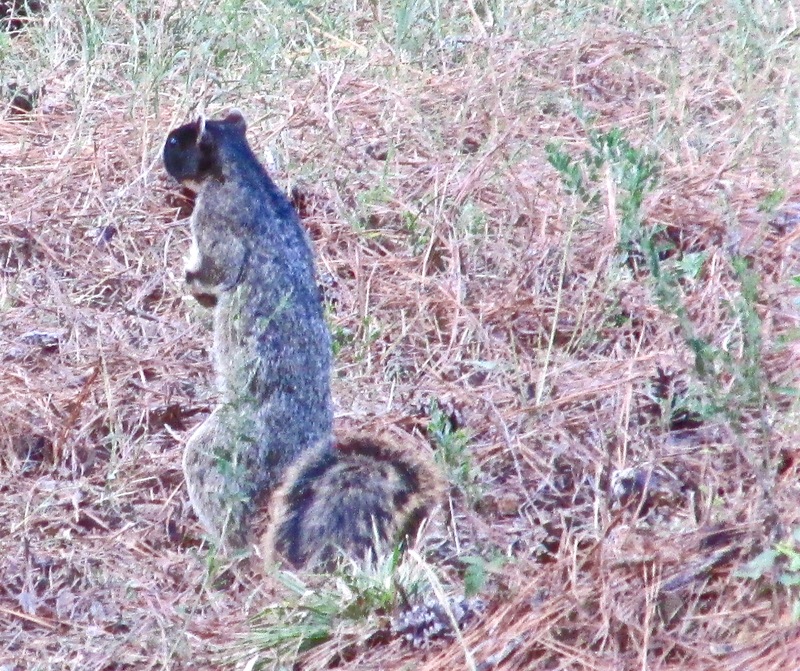 The squirrels eventually moved off into the thicket. All was quiet for the next half an hour. Then out of the corner of my eye – movement. It was that silent movement. Stealthy cautious foraging off to the left. Moving like a Ninja I twisted in my tree stand. Yes, there it was again, more movement. As I watched they crept closer and closer. 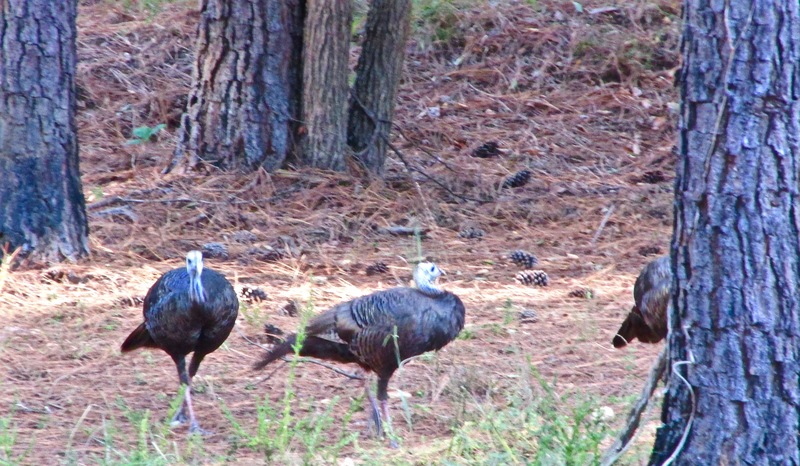 Before long, there they were, twenty-six yards away directly in from of me – a raft of turkey. 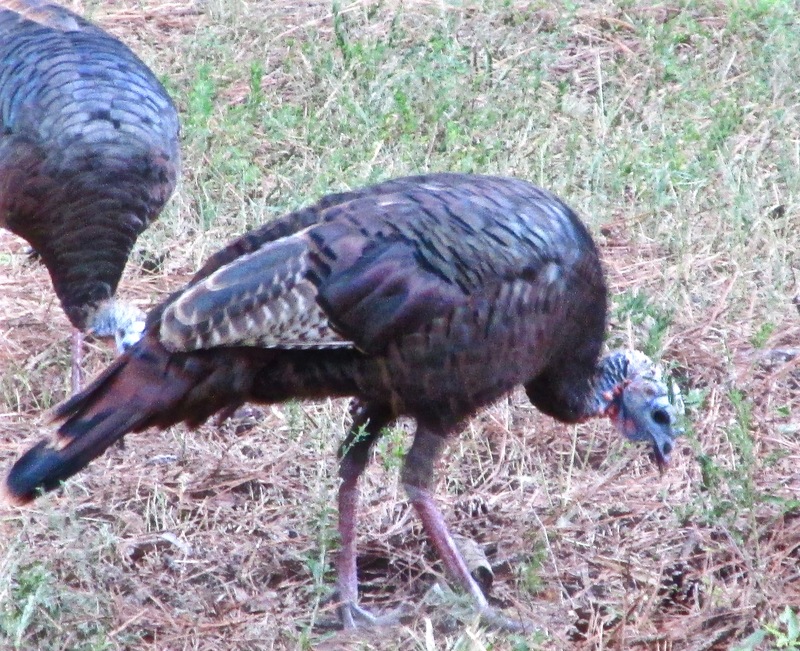 The turkey is a wary bird. Yet, these were so very close and in no hurry to move away. Shortly after their arrival the squirrels returned and began their quest for food aside their feathery friends. That mob of critters remained below me for an extended food rummage. 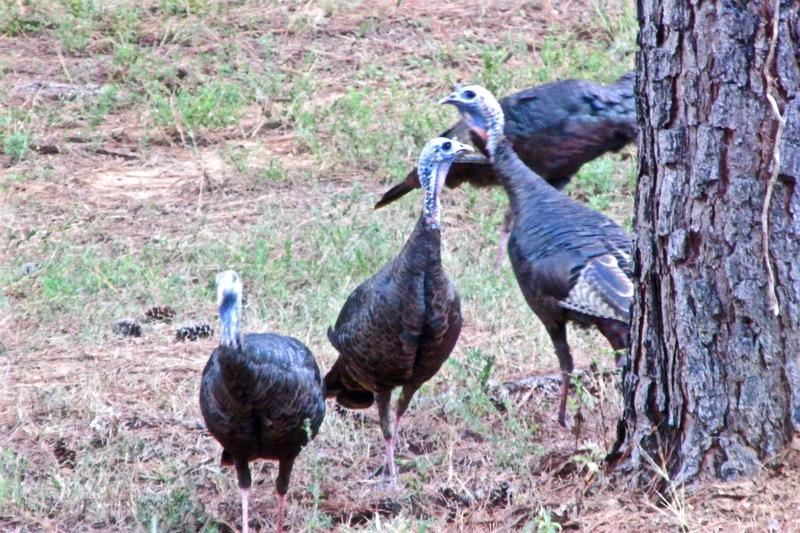 As the light began to dim the cluster of animals, feathered and furred, slowly headed into more dense woods or up into trees. My thoughts, perhaps they are making room for larger mammals on my horizon. 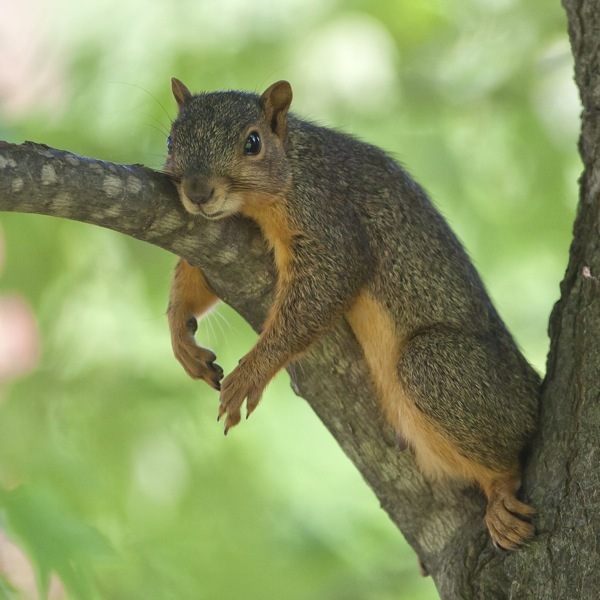 And there I remained with my thoughts until it was simply to late to sit in that tree any longer. I gathered my gear, packed it, attached packages and my bow to line and lowered it all to the ground. Then, making certain I was safe began my climb to red clay. Once off the ladder I collected my gear to begin my walk back. As I’d bent over to pick up my bow, thirty yards directly ahead, two doe gave me the eye and causally drifted away. In the final quarter of 2015, archery tournaments left the 3D arena and moved indoors. 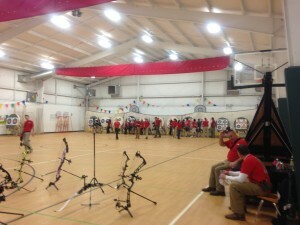 There were two events in archery where I was able to compete an indoor 3D tournament in Elizabeth City, NC and the 2nd Annual EAC 18-M Indoor Tournament in Madison, GA. In both events I competed in the Men’s Open (not in the senior age group) and finished 6th and 9th, respectively. 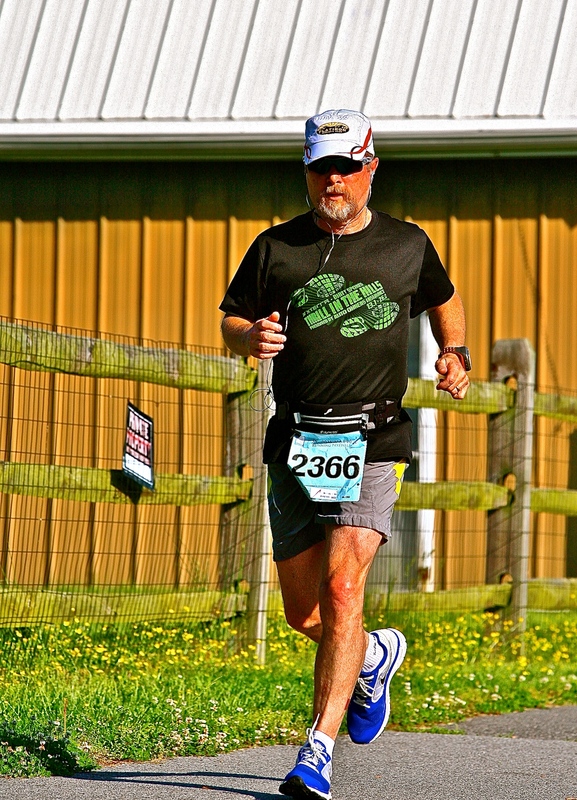 Neither offered a professional class (Pros shot in the Open class) I was also able to compete in four 5K races, winning 3 and finishing 4th in one, all running in my age group. In November I hunted in Georgia and left with enough venison (3 deer total) to stock our freezer until next year. If you follow my website or Facebook page you will note I never post photographs of me standing over a bloody dead animal. Personally, I’ve always found that a bit disrespectful to the animal, even though I have at times have posted photographs of how much meat (after processing and packaging) was harvested. Of those deer, I donated a portion of a church group here that helps feed needy families. During 2015, for archery tournaments only, I traveled approximately 13451 miles (excluding in town travel once I arrived at the destination). I shot in seven states: GA, NC, VA, DE, NY, and PA. 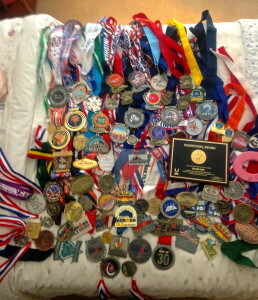 I shot in 21 events earning: 1st Place 5, 2nd Place, 2, 3rd Place 3, 4th Place 5, 5th Place 2, 6th Place, 3, 9th Place 1, 13th Place 1, 15th Place 1. This includes 1st Place USA National Indoor South (Snellville, GA.) and 13th IBO Pro Hunter Class (Ellicottville, NY). A decent showing considering I had never shot a compound bow until 28 months ago. I had shot a bow as a child and did enjoy the blue suction cup tips on my arrows until my mother took it away due to a difference of opinion related to acceptable targets. I might have been able to compete in more events barring our permanent move to NC along with the selling of one of our houses that consumed a number of weekends. I will miss the archers on Delmarva but the cost of maintaining the Maryland home was unwarranted. As 2016 approaches I am working on my competitive/training plan. That includes: archery training and competition, as well and other sports such as cycling, running and triathlon. In 2016, I hope to improve the site with professional support. I want more feature articles, those about a specific person or company. This buck remains free on the property in Georgia. Maybe we’ll meet on my next trip, unless he crosses paths with Ray first. 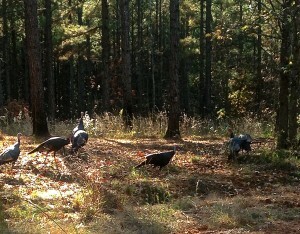 We’re just about to wrap up this hunting trip to Georgia. We didn’t get out everyday, we stayed home during the worst rain, and a few days didn’t pan out. Overall, it was fairly successful. We got out into the woods five times. I ended up with two does and one buck. Ray shot a doe, an 8-point buck, and a 250-pound pig. We might go out again, but I think we’ve got enough meat. The last two deer we took today. Ray shot his around 4 PM and I shot mine at around 5:15 PM. Both were taken to Adam Bohler in Tignal for processing. I’ve already picked up the first deer I shot and hope he’s got my second ready by Friday. These last two won’t be ready before I head back to NC. Ray will get them both up and store mine in a freezer until I can get back down to pick it up. There’s a nice 10-point buck roaming around on the property. I might head out for a bit tomorrow and see if I can get him. Or maybe I’ll hang out and practice shooting dots. In either case, we’ll be heading back to NC with plenty of meat. Ray, the tall fellow next to his good friend Guy. Another damp day with only a few deer spotted. I hunted with Ray, my father-in-law, and John a friend from Savannah. John’s also a paramedic so we’ve exchanged some medical war stories. Sadly, the war stories from the hunt today related a lost deer and one that never moved into range. Ray, today hunting with a rifle, hit an 8-point buck. The deer fell immediately, kicked then didn’t move. After a few minutes he left his blind and walked over to the fallen animal. As he approached, the wounded deer got up and ran off. A search for the deer ended when it became dark and the terrain too risky. We’ll continue at dawn. John saw one buck from his tree stand but couldn’t get an angle to take a shot before the deer was gone. I was primarily hunting pigs. Pigs migrate around the property and I seem to be either ahead or behind them for the moment. 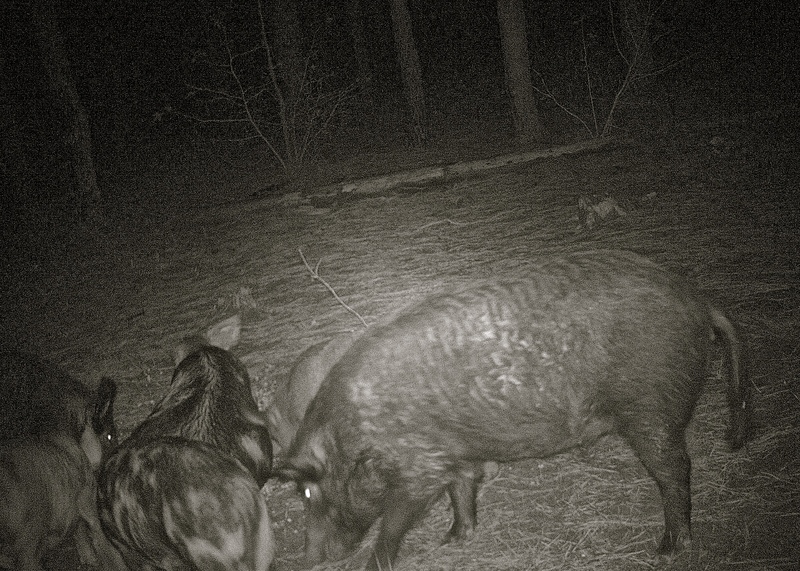 The hunt for pigs is on…. When I aim to shot a wild pig, I am not looking for a trophy. 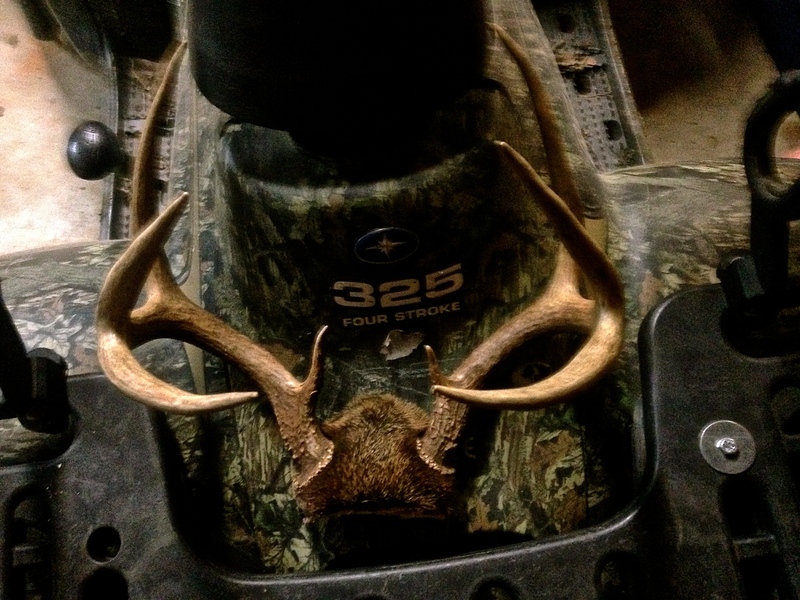 That’s not to say that is a true monster came within range that I wouldn’t shoot it. I’d shot it. But, I’ve seen lots of big wild pigs and I’m not easily impressed. What I want to get are the young smaller female pigs. Why? Because they taste best. 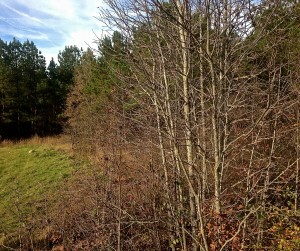 The first couple of days on this hunt in Georgia I was hunting deer. 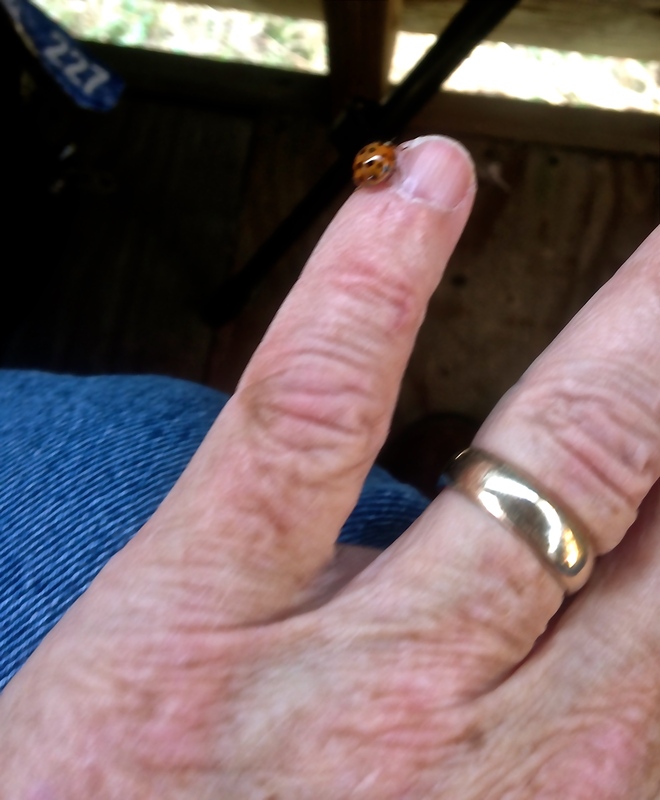 There are an abundance of them on Ray’s (my father-in-law) property. I harvested exactly what I was after. A smallish doe. I had a pick of deer and I chose her guessing that one of the bunch would be the best for cooking. The next week or so, it is strictly a hunt for pigs. Like I said, I want the pork, which for me means a small pig. Ray shot one, a 250 pound boar. It made decent sausage but the pork chops were too tough. When I worked for a hunting club, Hall Brothers in Savannah, and we’d have a pig barbecue I’d always chose a nice smaller pig. Slow cooked for hours it was excellent. Today, I didn’t see anything in the woods other than a squirrel. Grilled squirrel isn’t so bad, as I remember it, however squirrel isn’t on the menu. 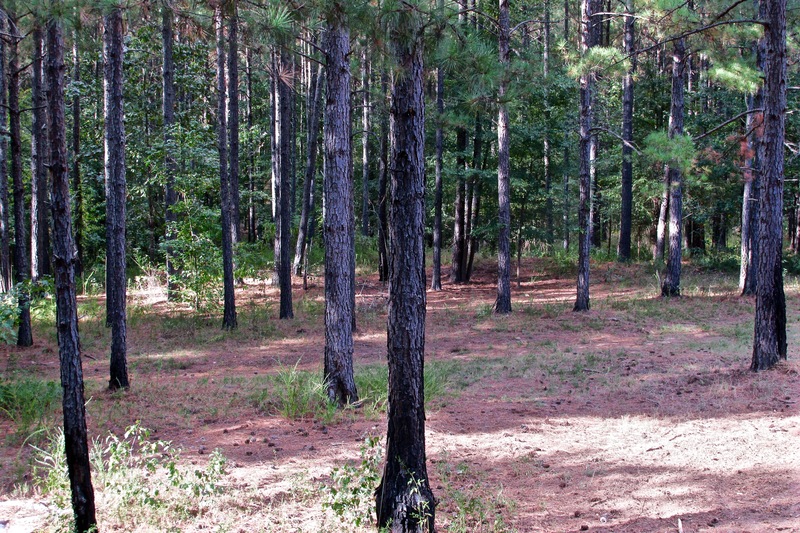 Tomorrow there’s a 70% chance of rain and I may skip the woods and head over to Social Circle to shoot. Depends on how hard it rains. Author David LainPosted on November 22, 2015 Categories HuntingTags Outdoor AdventureLeave a comment on The hunt for pigs is on…. Thus far, the hunting has been getting colder and wetter. 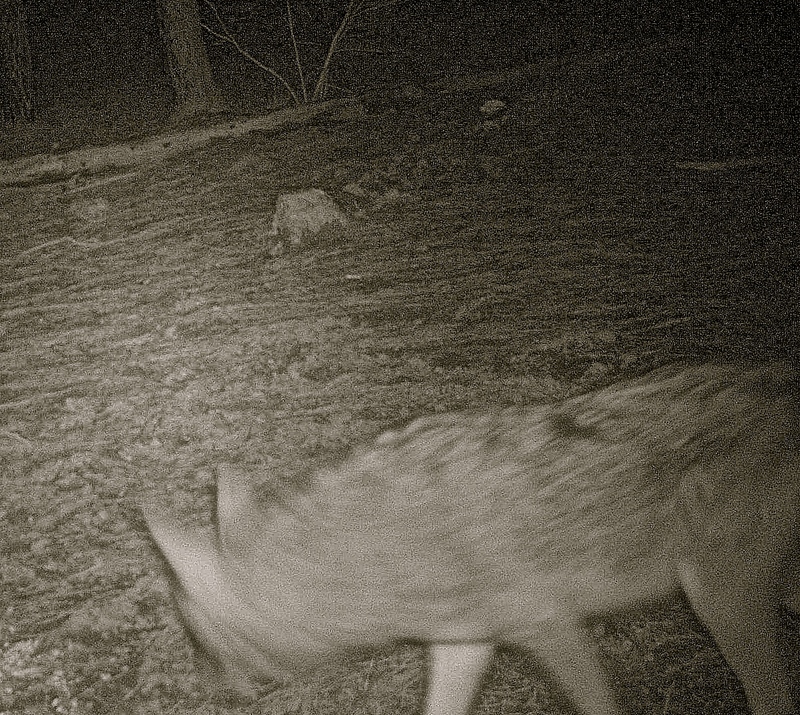 We’ve seen a lot of animals on the trail cams. 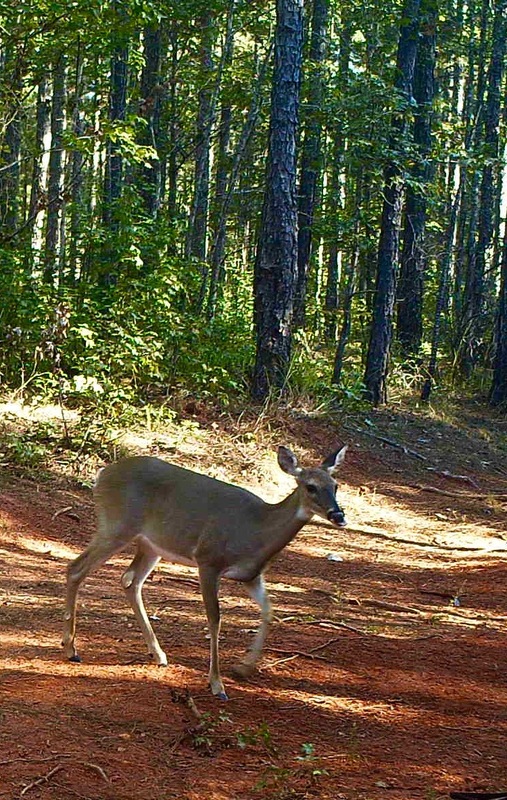 There have been deer spotted on the trails coming into the wood both early, mid-day, and in the evening. I’ve only shot one so far. 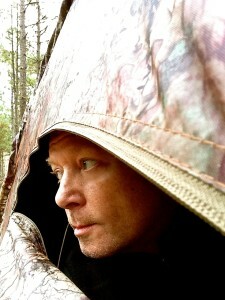 It rained hard the other day, which kept us away from hunting. 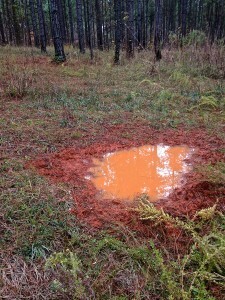 When we did go back into the woods the red clay paths we follow were extremely slippery. The early morning temperatures have been in the upper 30s. At this point what I am aiming for are small pigs. 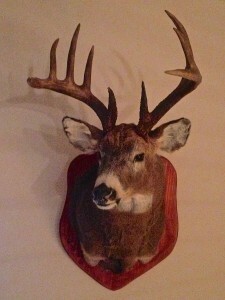 Ray, my father-in-law, shot a big one. We’ve eaten some of it and it was a tad on the tough side. Even though the pigs mostly come out at night, we’ve recorded then on the Bush Trail Cameras throughout the day. One more doe will be plenty for Brenda and I. I expect I’ll get that one once I can shoot a doe, again. 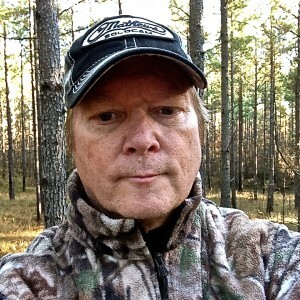 In Georgia there a short time period during deer season where does are off limit. We’re in that time frame at the moment – it ends on Monday. 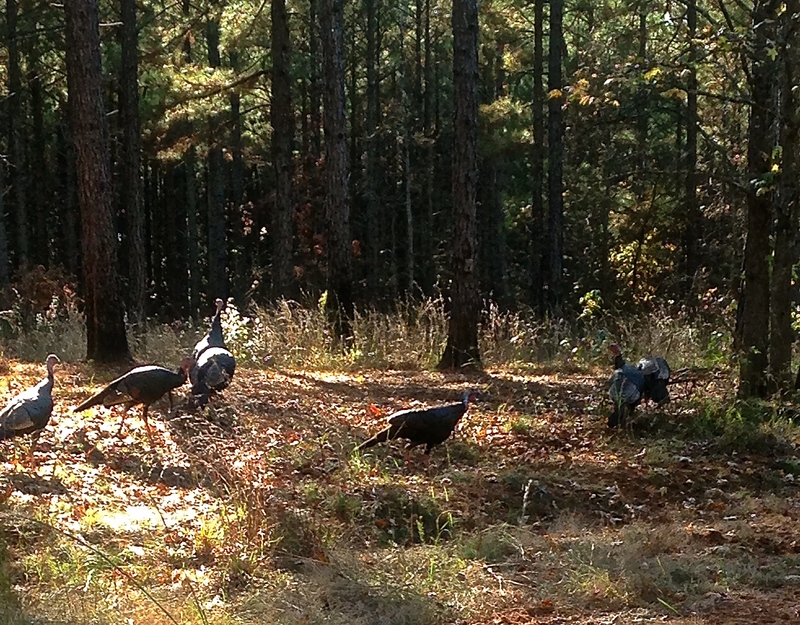 Unless I see a 10-pt or 8-pt buck, and we’ve seen them in pictures, I’ll hunt pigs. There’s also an abundance of coyote here this year and I wouldn’t mind getting one or two of them off the property. My father-in-law, Ray, hunting several kilometers away on his 800-acre property had at least seen several doe. (Note: plural does or doe –Both does and doe are correct for plural.) He’d spied a large buck and hoped it move out of the thicker woods so that he might get a shot. 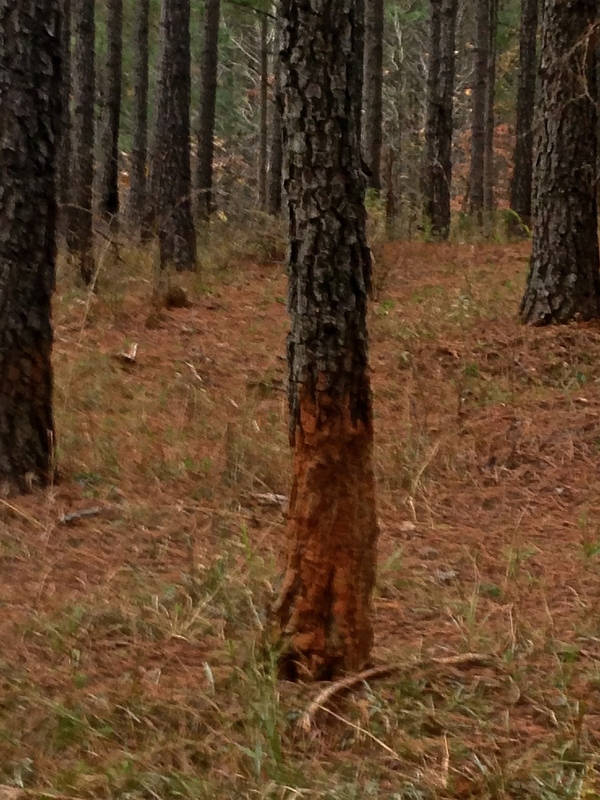 The buck stayed away and Ray didn’t bother with the other deer. As a result, we ended day one empty handed. On the second day, Ray saw the two doves, or at least a similar pair. When 6 doe came my way I was less picky than Ray had been on the previous day and took one. I didn’t shoot the largest. 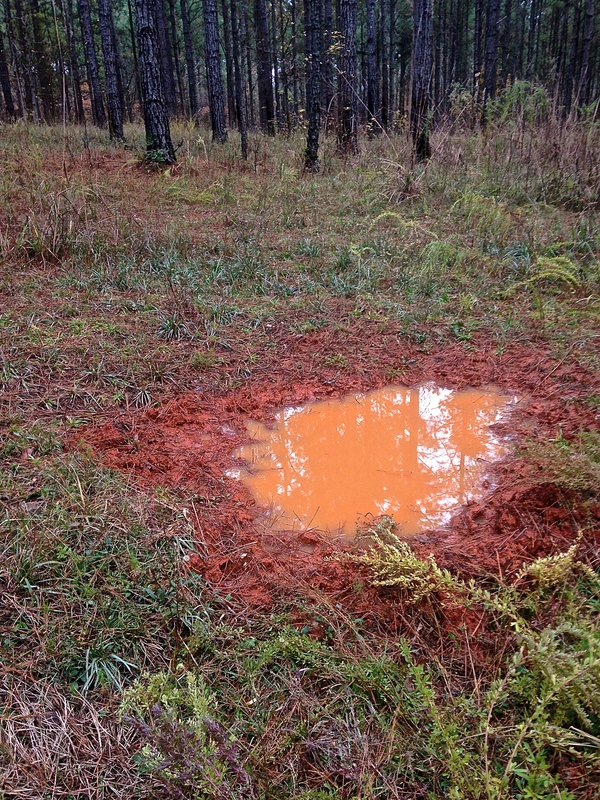 I was “way-back” in the woods with plenty of wet red clay to deal with on the way out. I made sure that whatever I decided to shoot, I’d be able to get it on the ATV. 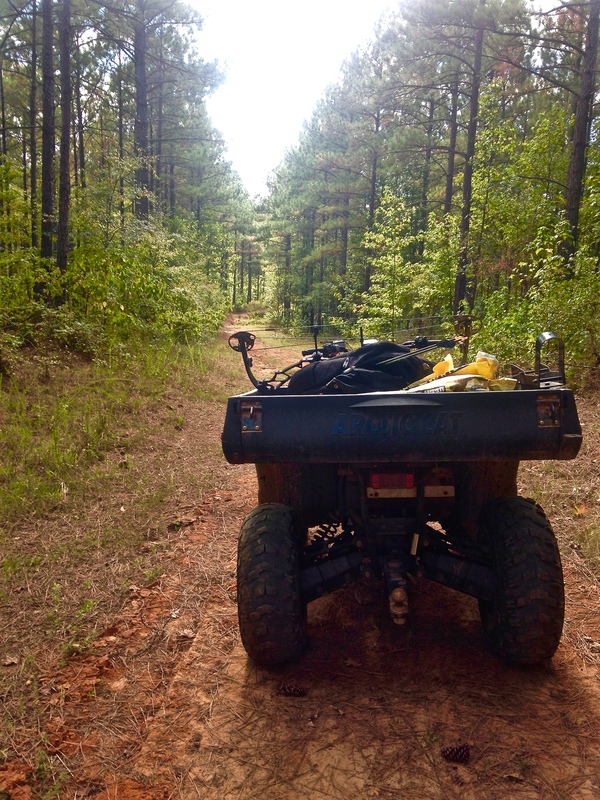 Still, getting the doe on the ATV was a bloody mess. Last year, Ray and I hauled several big deer out of the woods. More than once one of us bit the dust trying to get a deer out of ravines and thickets. So, I like having a plan of how I’m going to get what I harvest to the fellow that processes the meat. Ray’s got three refrigerators here and their freezer sections are all full. I’m hoping to get another pig and one more deer. Ray’s considering buying a freezer, I’m thinking I may need another ice chest to get this year’s meat back to North Carolina. We’ve still got another two weeks of hunting to go here before heading back to Hertford.